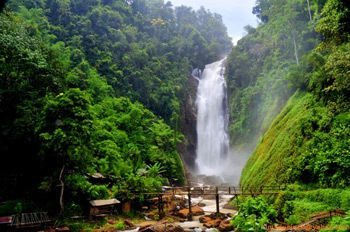 It is the highest waterfall in South Sumatra, located near Bedegung village in Tanjung Agung district, about 56 kilometers South of Muara Enim Regency. Rich in the number of small as well as big rivers flowing through this province, waterfalls of various sizes come with them too. Tenang_ waterfall where the water smashes down from 90 meters height into a deep pool and further downstream in a strong current. It can reach by public transportation and takes 2 hours from Palembang, however, less by private car. The Muara Enim regency, two hours from Palembang, is a land of rivers and waterfalls.